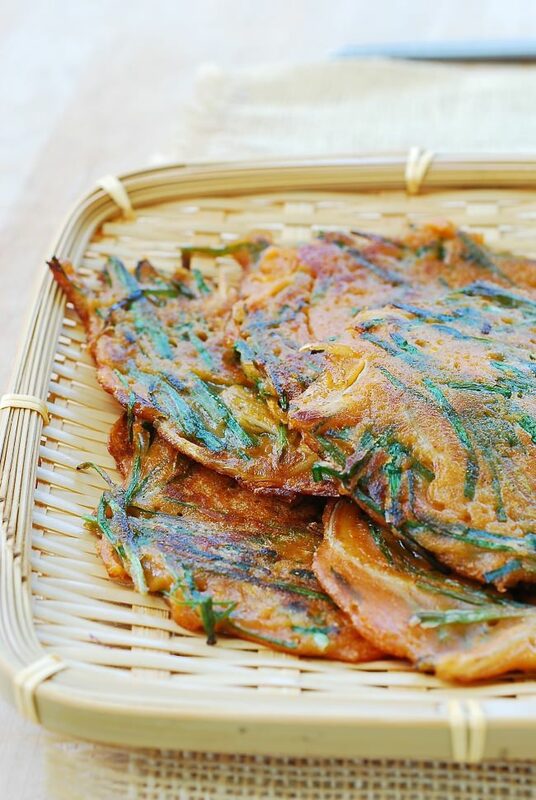 Savory pancakes are a big part of Korean home cooking. 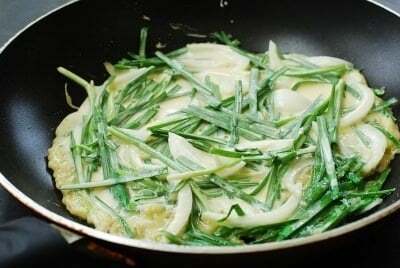 Koreans make pancakes with all sorts of ingredients — kimchi (kimchijeon), seafood and scallions (haemul pajeon), potato (gamjajeon), zucchini (hobak buchim), etc. 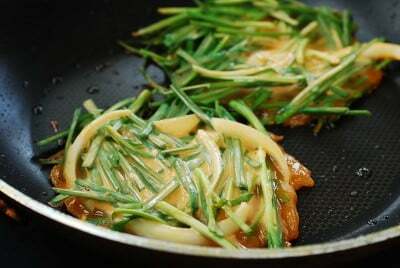 This buchujeon (부추전) is made with buchu (부추), Korean garlic chives. 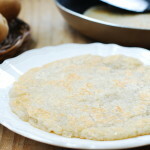 It’s another very common pancake at Korean homes! Garlic chives have dark green flat leaves and a delicate garlic flavor. 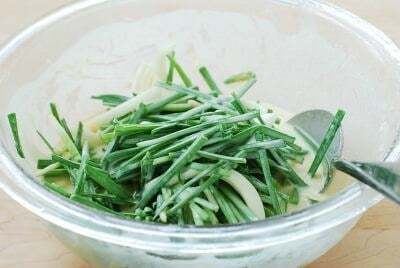 Korean garlic chives are thinner and tenderer than Chinese garlic chives commonly found in America. 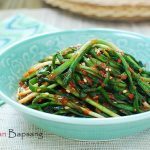 For this recipe, I used Korean garlic chives I grew in my backyard, but they are also available at Korean markets. 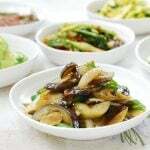 If you can’t find Korean chives, you can use the Chinese variety for this recipe. Look for ones with thin and narrow blades. Buchujeon can be made simply with buchu, but I also added thinly sliced onions here. It adds delicious sweetness to the pancakes. 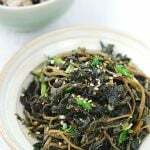 Sometimes, I also add thinly sliced perilla leaves (깻잎, kkaennip) and/or chili peppers. If you like it a bit meaty, add some minced pork. 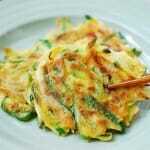 Korean pancake mix (buchim garu, 부침가루) is best to use for Korean savory pancakes. The ready made mix includes cornstarch, and/or rice powder for crispy pancakes and is flavored with garlic and onion powder and seasoned. If you can’t find it, use flour and add a couple of spoons of cornstarch or rice powder and season with salt. 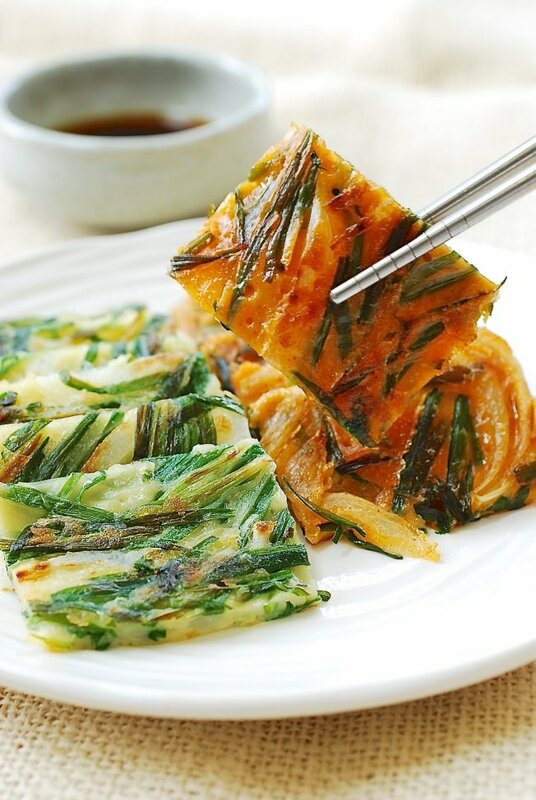 When savory pancakes are seasoned with gochujang (Korean chili pepper paste) and/or doenjang (Korean fermented soybean paste), they are called jangtteok (장떡), so the red version of this pancake I am showing here is actually called buchu jangtteok (부추장떡). 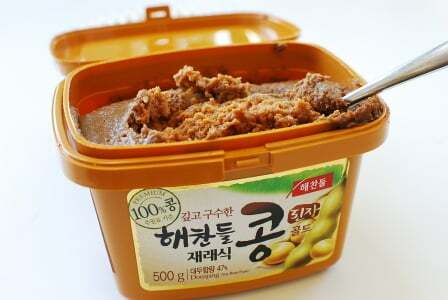 You can simply add gochujang, doenjang or a combination. 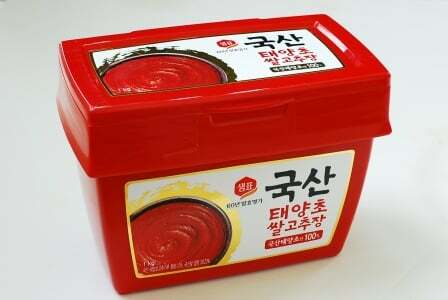 In this recipe, I just used gochujang. It adds a nice spicy kick to the pancakes. You can make 2 large pancakes with this recipe. Cut into small pieces before serving or simply let the diners tear with the chopsticks as they eat. Or, make a few small pieces instead. 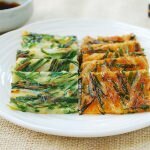 Korean savory pancakes made with garlic chives! 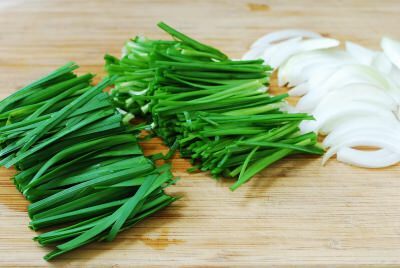 Cut the garlic chives into about 2-inch length pieces. Thinly slice the onion. 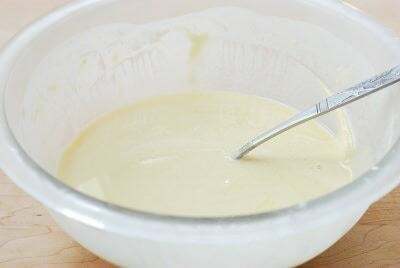 Add the pancake mix to a large bowl. 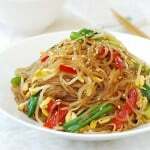 Stir in 1 cup of icy cold water and the soy sauce (or gochujang for the spicy version) and mix lightly. The batter should be thin. Mix in the garlic chives and onion. Heat one tablespoon of oil in a non-stick pan over medium heat. Ladle the mixture into the pan, and spread it evenly into a thin round shape. Cook until the edges turn light golden brown, about 2 to 3 minutes. Reduce the heat to medium low if the pancake browns too quickly. Turn it over, adding more oil to the sides of the pan, and press it down with a spatula. Cook until the other side is light golden brown, about 2 minutes. Repeat the process until there is no remaining batter and the optional spicy version. Serve with a dipping sauce. Yummy! Is it possible to make a gluten-free version? Thanks Hyosun! I’ve tried few times to make a good 전 but I’ve never been successful so I’m willing to try this recipe!! Thank you! What was wrong with your jeon before? The batter should be cold, the pan should be preheated and use generous amount of oil. 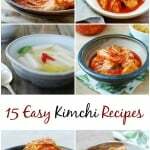 Thank-You for sharing these recipees! They sound great! Wow this was so delicious and easy to make! I made the plain one but will try making the spicy version soon! Great! Thanks for letting me know. You’ll like the spicy version too. I’m thinking about making these to take to an Easter Brunch potluck… just worried that it’ll be too cold/soggy to eat after sitting a while. One of my favorite comfort foods that my mom would make often. Hi Elain – It will still be good. Also, if it’s an option, you can bring all the ingredients prepped and pan fry at the brunch location. Happy Easter! Hi Hyosun! 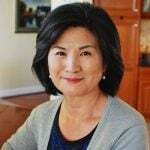 First, thank you so much for sharing your delicious recipes. I’ve tried some of it and never failed. 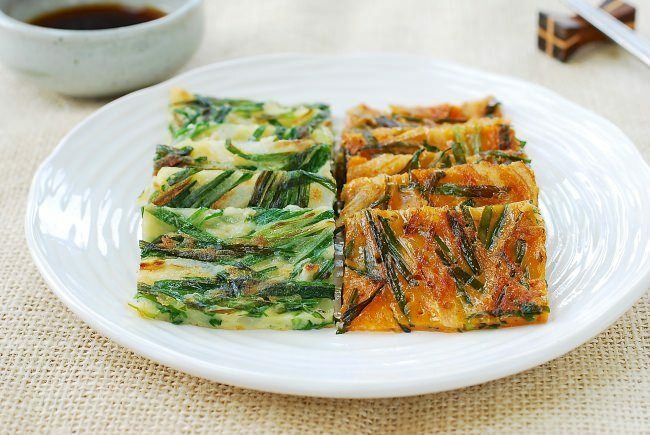 Just a question though, I can’t seem to get the right flavor of pajeon. Do you prefer any brand of buchimgaru? I also can’t find a ssamjang that tastes the same from the restaurants. Looking forward to more of your posts!!! Looks yummy… will try this soon! I love your recipe! I make mine a bit thinner, a bit thicker French crêpes, and love them that way as well. Today, I combined aehobak, sliced shallots, and buchu and perilla from the garden. I added a bit of fish sauce to the batter (thinking of how aehobak is usually prepared with salted shrimp) in addition to the soup soy sauce, and used Chinese black vinegar for the dipping sauce. There are so many ways to play with this delicious recipe. I’m so grateful to you for introducing me to the idea! I made the spicy one for dinner according to your recipe. It’s soooooooo good! Thank you! I’ve been trying your recipes and they’re amazing. You’re my new hero!!! I purchased a package of buchim garu but am not sure about the measurements for the mix and liquid. I can figure out the dry mix because the directions list grams. Same with the liquid because it’s in mL. Other than that, are there any tricks to know? Stand time, etc. I’m use to making Okonomiyaki from mix.